From the archives of "Geoffrey Barnes, Connoisseur of Mysteries" come high tension tales of suspense, of intrigue, of crime and passion. These are presented by some of radio's top professionals in a style that's "smooth�so smooth -- and slick�so slick!" 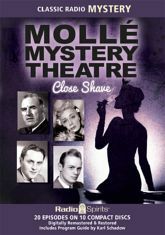 A Tuesday night radio favorite for years, here's your ticket to the Molle Mystery Theatre! Step inside for sixteen digitally restored and remastered episodes of "the best in mystery and detective fiction."